Rustic and elegant, this Personalized Set of Five Glass Flasks is ideal for anyone who loves old-fashioned drinkware! 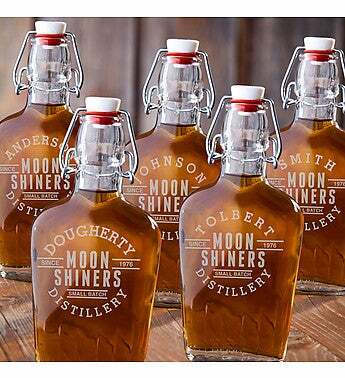 With their charming and whimsical design, these personalized flasks are perfect for any Father's Day, Birthday, or groomsmen gift. In addition, each flask can be personalized differently from one another so that each one is individualized! 8" x 3 3/4" 1 1/2"